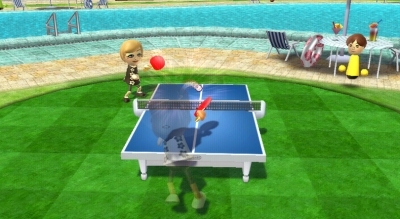 Wii-Sports Resort Table Tennis is quite possibly the closest I've felt to playing a real sport in a video game. The fidelity of control offered by MotionPlus means I can employ all my real world Table Tennis tactics almost without realising it. 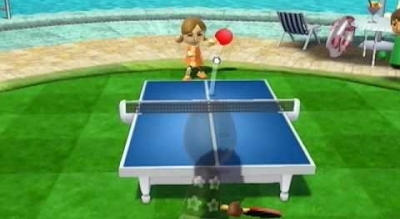 Table Tennis was the subject of much hype early on in the life of the Wii. The mighty Rockstar stepped up with their Table Tennis title on Nintendo's machine. They did what, at the time, appeared to be a stalwart and attractive job of rendering the nuance of (what is often called) Ping Pong to the video gaming masses. Then there was the surprisingly fun Balls of Fury tie in on the Wii and DS. 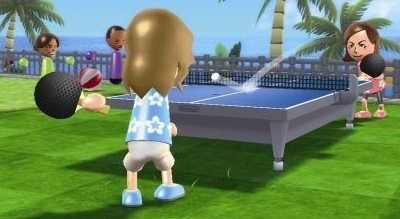 But play Wii-Sports Resort Table Tennis for even a couple of minutes and it is clear that all other racket sport games are now living in the past. It's a similar situation to Wii-Sports Tennis, but here the game is fleshed out and of course they have the accuracy from MotionPlus. A gentle twist of the wrist changes the degree of spin as the timing of the shot controls the direction. This is a coupling of timing and control that mirrors the real game surprisingly well. A couple of evenings in to the game and I realised that I was working my opponent around the table the same way I (try to) do in real life. As I edge them left with each shot and try and time my attack to land just before they have a chance to counter. It was nothing short of magical. The effect here extends beyond other Table Tennis games to most video game racket sports. Even going back to Grand Slam Tennis Wii (of which I still am a big fan), and it's immediately obvious that there is a big disconnect between your motions and the results. Table Tennis nails that one-to-one relationship so that you hit the ball at the same time as you swing the controller. 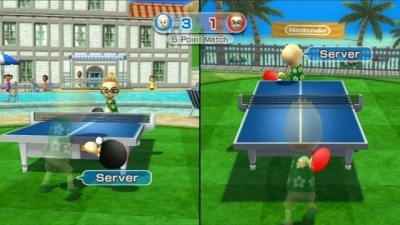 Wii-Sports Resort's simple visuals enable them to pump more computing at calculating and instantly applying the controls. It tricked me into treating it as if it was a real sport. A few weeks in I'm still finding a lot of fun in the game. 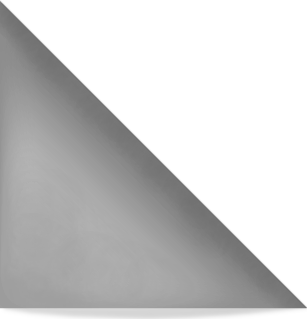 My attention is start to turn from the computer opponents to real life competitors, but my enthusiasm is so far undiminished. In fact the more I play the more techniques I add to my arsenal. Last minute twists of the controller to get that extra bit of spin. Floating in a slow ball to trick an over zealous opponent to hit before the bounce. Honing my table scraping edge shots. Perhaps most telling though is my instinctive body shielding of my serve to disguise my serve spin. It wasn't something I planned beforehand, but just happened as I stepped up to serve. This for me, is the biggest success for the game, that it tricked me into treating it as if it was a real sport. And maybe in some ways it kind of is. Next week I'll be taking on Wii-Sports Resort Archery. David Kenson writes the Sports Gamer column. "I bring twenty or so years of enthusiasm for, and experience of, sports to bear on my reviews of all sorts of sporting games. I've usually got what John Virgo would call the 'commentators eye' because I've played in the real world." © GamePeople 2006-13 | Contact | Huh? With so many different perspectives it can be hard to know where to start - a little like walking into a crowded pub. Sorry about that. But so far we've not found a way to streamline our review output - there's basically too much of it. So, rather than dilute things for newcomers we have decided to live with the hubbub while helping new readers find the columnists they will enjoy.